Being an outsider has come into vogue. Donald Trump — praise be His Hairness — is largely in contention for the 2016 Republican presidential primary because he is an outsider who does not play by the rules. Hillary Clinton’s massive pre-election-cycle support has been checked by her image as a political insider and the baggage that such a label implies. In American culture, it appears we have come to value an outside opinion — and with good reason. Outsiders are seemingly free from systemic bias and can instead offer a fair, objective evaluation of an organization. If nothing else, they can provide a new point of view, not steeped in tradition or how things have always been done. This is the great — if only — advantage of being a ’19. We have an outside perspective. I may have called the Choates “Ko-ates,” and I may carry my room key on a lanyard, but I also come from outside of the Dartmouth bubble. For most intents and purposes, this makes me practically useless. I am still floundering in the rising waters of this new college life. For example, I started this piece with a quotation — now deleted by my editors, as you can see. I am still a foreign object in the student body. Yet, it surely will not take long for this institution’s many support systems to sterilize and suture the opening my class’s presence has caused. In that interim, however, we bring a shock of new and valuable information. Dartmouth can be a very insular institution, and while this much is true of most colleges, its location and intensely social culture makes this reality especially salient here. So, each new class becomes a report from the front. 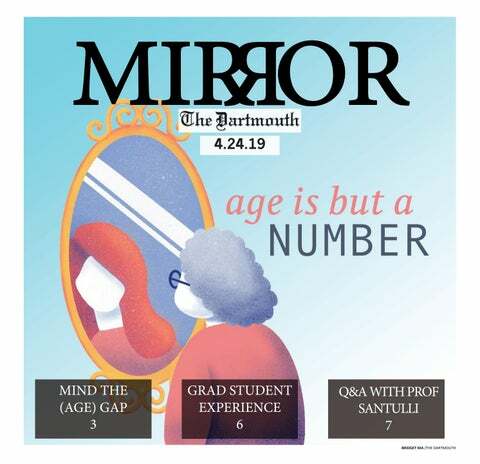 Right now, we ’19s are probably the best metric with which to measure how Dartmouth is managing its image and its social reality. The College has seen its applications drop in the past few years — and yet here we are, the Class of 2019. We are proof that something worked. In my case, it was the Dimensions of Dartmouth program — honestly, keep that up. I saw enough people call their parents and commit on the spot during Dimensions to know that it works. I am certain, however, that we are also proof that the College still has much work to do. First-years can be like bloodhounds — or at the very least, determined pugs. We will, inevitably, try to find the most valuable extracurriculars. We will, inevitably, try to find the best classes. We will, inevitably, fail in some regards. But which classes see massive enrollments tells us something about the word on the street. The Class of 2019 is full of very different individuals, yet the movement of the herd tells us something. If my first-year peers are any indication, students still set a course for economics majors and finance jobs very early on. Clubs pine for new members each fall, which means that ’19s are a valuable resource as well as a metric of which extracurriculars are in vogue. The ultimate frisbee team certainly saw a good showing and the poker society’s free buy-in required several extra tables to be set up. As any club leader could tell you, every fall first-years are a transfusion to replace outgoing seniors. It is a good thing, then, that first-years are universal donors. We can pretty much be molded into anything and everything that this college needs. Hopefully, and more importantly, we will also bring something new — a class starting out within the post-“Moving Dartmouth Forward” paradigm. Ideally, we will show that the revamped pre-matriculation alcohol and sexual assault programs worked. More realistically, we may be proof that more work is needed. Either way, it is valuable information. As first-years, we will not be outsiders for long. The College does its best to make us feel included, and older students do an excellent job. For better and for worse, the Class of 2019 will soon become Dartmouth insiders. This is not a bleak future — I do not believe we need to reject the culture of the College en masse. I simply hope that we have brought something new, something useful. We enter college as the turmoil over Greek life across the nation rises, and maybe because of that will be a more reform-minded class. Maybe our economics majors will have art history minors. Maybe will lower the numbers on sexual assault and relationship violence. Of course, none of this is guaranteed. But I hope that — innocent and unlearned as we may be — our doe-eyes envision a better future for Dartmouth.